Sue G: Two years ago, we gave the CC Solar Observer to everyone in our family for Christmas and WOW! !……..we still see them using the radio all the time, even the grown “kids”. Last year we gave everyone in our family the Unity Plus LED Flashlight. We knew they were great flashlights because we use them all the time, but we didn’t know they would be such a big hit. Every single person we gave the flashlight to loves it. These were the BEST gifts we have ever given to our family. It’s pretty cool to know they liked the gift they got and they actually use it!! We will never buy anyone a sweater for Christmas again. Carolyn: Last year I gave the Senta 40 Wooden Headphones to my best friend’s teenage granddaughter for Christmas. She is blind, so superior audio quality is an absolute must or she finds the distortions too uncomfortable for her sensitive ears. When I talked to her after the holidays I was so happy to hear the Senta 40 model passed her high standards, and that they were now her favorite pair of headphones! I gave my hard to shop for brother-in-law the Unity Plus LED Flashlight. He was immediately impressed by the light output and could not wait to take it outside and test it. So there he was on Christmas Eve, running around outside like a little kid at 70 years old, shining his new toy in all directions while everyone else was eating dinner. Needless to say, I knew I had a hit and plan to give my other brother-in-laws the Unity Plus LED Flashlight this Christmas. Hopefully, they will finish dinner first. I gave my new daughter-in-law the Senta Ally Bluetooth® Stereo Speaker for Christmas. She is a college professor, and needed an easy way for her entire classroom to hear the audio stream on her laptop, which was not cutting it. It turns out the Senta Ally was perfect for her! It is lightweight and small enough to fit in her laptop carry case, and it just takes her a minute to connect it to the headphone jack & set it for Audio Input mode. Even students at the back of the room can hear it clearly, so no one can claim they missed something. So the Senta Ally got an “A” from her! Christine: I’ve put Power Vivid flashlights in my three kids’ (and partner’s) Christmas stockings every year since we started carrying them. Kim: The Ally is a gift I bought recently for my daughter. She loves it. She puts on the baby station for her son and puts it in his room for his ears only! She doesn’t have to listen to his tunes. My son-in-law loves it too. He takes it to work to listen to his tunes while he is working. Oh yeah and the husband loves his Unity Flashlight as well. Brett: We have a few relatives in their 70s- we give them a CCRadio-EP or CC Solar Observer. A couple months goes by and then we get the “What a great radio!” emails. An awful lot of radio lovers do find the simplicity of the EP is what they have always really wanted. John: I’ve given several gifts over the years: Light bulbs like the PowerVivid A15 LED Bulb and Color Changing LED Bulb; The Unity Plus Flashlight and PowerVivid Pocket Lights; The Senta Ally Portable Bluetooth Speaker – friends use them to stream music using Bluetooth®; CC Shortwave Pocket Radio so my Aunt can pick up the Fresno State Bulldog’s games and the CC Solar Observer which was a life saver for my aunt in Maine who was without power for an entire week after a snowstorm. Jessica: Over the 18 years I’ve been employed by C. Crane, I’ve given quite a few C. Crane products as gifts. The CC WiFi is the one I hear about most. My husband’s 89 year old grandmother is from St. John’s in Canada and she’s able to hear news and music from her homeland. We set it up for her and pre-programmed the stations and she listens to it almost every day. I regularly give out flashlights. My favorite is still the CCTrek Light. I have one that’s almost 15 years old and the only thing I’ve done is change the batteries and recently replaced the LED module. It says a lot about a company when employees buy products from where they work. Kind of like when people work in a restaurant and you see them eating there, then you know it’s a good choice. So here’s to never buying anyone a sweater or tie for Christmas again! I always check into C.Crane for the latest, state of the art tech. and for a decent price. I will be investing into the 3 mile wifi as it will be cheaper than hard wiring. Last year, I asked Mrs. Claus for a brand new CC Witness Plus for Christmas. Instead, I received a sweater very similar (almost exactly) to the one you show in your picture (I’m sure you could Imagine the look of surprise on my face Christmas morning). Although it was a very “festive” sweater, it was unfortunately, too small for me to wear. I quickly tried to re-gift it, but our neighbor’s Rottweiler would have nothing to do with it. 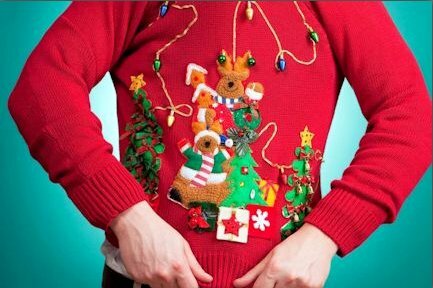 I believe “the sweater” accidentally found it’s way to the Goodwill box and was mistakenly taken away along with my wife’s fruitcake and an enigmatic knot of Christmas Tree lights that I had spent 5 years trying to untangle.. I’ll show my wife the picture that you posted…I’m sure she’ll be happy to see that “the sweater” has found a good home and that someone at CCrane shares her good taste in “festive” holiday sweaters.